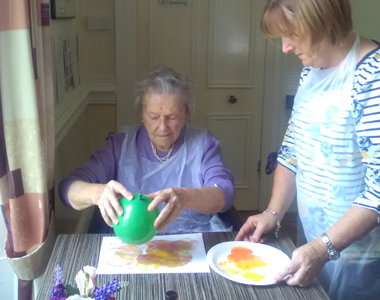 They do things differently at Drummaul House and nowhere is this more apparent than in their Art Group. 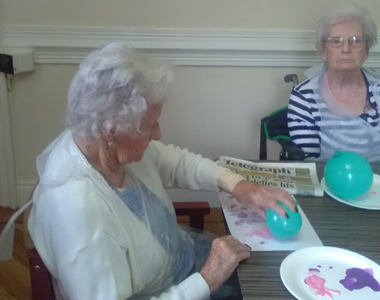 They held an art group where they used small balloons to paint patterns on to pages and they used the balloon because it is easier to manage than a paint brush. All who joined in enjoyed making the patterns on the page and they also had an option of creating art with modelling icing. 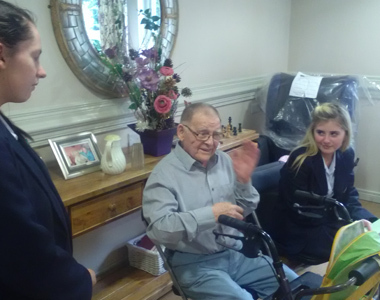 In other news they also have started intergenerational work and St.Benedict’s College pupils in Randalstown come in and talk to the residents, play games and reminisce. Everyone is looking looking forward to seeing them every Tuesday afternoon.